With two feet inside the ETSU logo, 30 feet from the basket, Troy Daniels rose and fired what would turn out to be his 10th made three-pointer of the evening. As the players ran back down the floor, I offered Robby one of the most insightful pieces of basketball analysis in radio history. The Dagger's Jeff Eisenberg does an outstanding job giving you the detail of Troy's gunslinging ways. Side note: I think it's safe to say Troy Daniels is one of the great college basketball shooters. Daniels hails from Roanoke, VA, which is also the hometown of JJ Redick and Curtis Staples, two of the all time college basketball shooting greats. Roanoke, VA–home of the swish. Let's start with Rob Brandenberg. Shaka Smart sat him down last night due to a strained groin. If he would've been needed, Brandenberg could've made a go at it. Brandenberg is expected back in the starting lineup on Saturday against Lehigh. As for the game, stop me if you've heard this before: VCU forced a pile of turnovers early, building a big lead. There was a mid-half defensive lull and the Rams were a little sloppy on offense. However they kept it together and finished strong, except for the opponent hitting a three at the buzzer. The second half saw VCU step on the gas pedal and increase the lead. The last eight minutes were played under YMCA rules. I don't that there's much what to this game. There is little abstraction that can be taken. I've got think that the fourth game in which nobody played more than about 25 minutes is helpful come February. Maybe. And it's nice to get the bench players some gametime run. But I can't fake it with you–this was a whipping. Enjoy it, because the season gets tougher right…about…now. At the 17:56 mark of the first half, Daniels swished his second three in 18 seconds to give VCU a 9-2 lead. The boat race was on. successful, those guys need to want to do it every game." 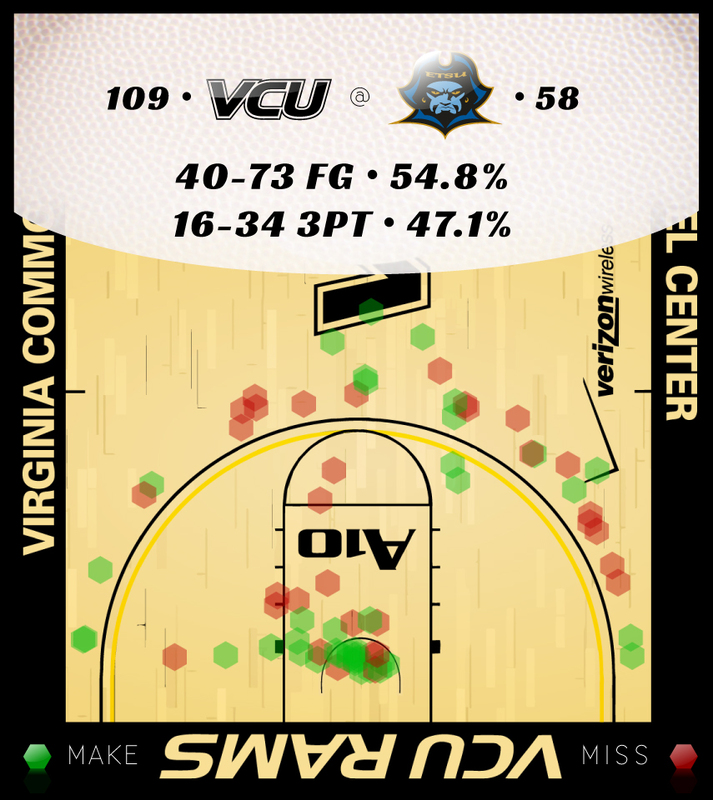 VCU grabbed 21 offensive rebounds and shot 40-73 (54%) on the evening. That means the Rams grabbed roughly 60% of its misses. Phenomenal. And this: Troy Daniels is 61-136 from three this year. VCU opponents–all of them combined–are 62-217 from three this year. continues to be erratic. That’s a key ingredient in losing close games (ahem). And we are one nonconference game from the start of the initial A10 season and a very good Dayton team, with an opponent that is much better than "Lehigh Mountain Hawks" suggests. This Lehigh team has an NBA lottery pick in its starting lineup named CJ McCollum. ***Troy Daniels. Here’s all you need. three stickbacks hit his ledger in the first half, and it led to a 19/10 double-double. committed. On a rough night, Reddic was rougher. In the good way. Courtesy Jeff Horne, who told me " I had to change my graphics to account for the distance on some of these shots." VCU at ETSU: A Road Game? Wha? Mike, no one outside of the players and coaching staff has their finger so firmly planted on the pulse of this team as you. Thanks, and keep up the good work.